All-Star is a safe and fun environment for swimmers of all levels – whether it’s learning the basics of water safety to refining strokes for competitive swimming. We begin working with children starting at 6 months of age through their youth, as well as children with special needs. We ensure that every child not only learns to swim, but has a positive experience. We designed our swim program based on four key stages of swim development: water safety, learning to swim, stroke development, and technical stroke refinement. All-Star can also customize any program to meet the needs and goals of every swimmer. We hire only the best swim instructors. They are personally trained by All-Star founders Brian and Jennifer Oas to help children of all swim levels and learning abilities. Our team of instructors have both a love of the sport and a passion for working with children. 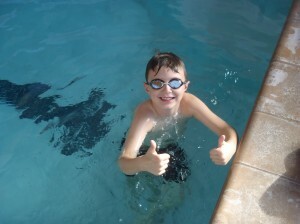 At All-Star students learn to swim like fish and feel like stars!